Remote Tech Support Software - PC Remote Support via On-demand Desktop Remote Control Through the Web - Remote PC Assistance Software. Java or any other pre-installed software is NOT required on the remote client computer although it will take advantage of it if available. If your client or customer has initiated a remote support session by entering your viewer id number on our homepage, clicked a link on your web site that opens the connect page on our site or you've emailed them a support link that opens the connect page, they will as you know, have to click on the connect button to continue. On the page that follows, if a minimum Java 6.0 is not installed on the remote computer, they will use the "CLICK HERE" option located on the same page to start the download of the executable for them to run (open). You may have even placed our executable support program, 4Support.exe, on your web site for your clients to download and open for remote support. The first prompt requests the remote user to select what action the system is to perform on the file that will be downloaded. The file could be saved locally and used for a future remote support session with the client. The option to save the file and with which remote users is up to you. The file if saved an run later will work the same as shown on this page with the same Vista specific prompts shown below. There may be a second similar prompt asking for a confirmation or permission to run the program. When the program Runs, the remote user will be prompted to enter your viewer id number (this is required when the program is run regardless of browser or operating system). The remote user must enter your viewer id (your viewer id is shown on your user page). The 4Support.exe program then proceeds through its role to connect the remote user's desktop to your viewer for remote control access. After the screen above is displayed, the program attempts to connect to you (you've already started your viewer on your computer and tested your configuration like the instructions state, right? ). Once connected, you'll see the remote desktop and have remote control of their computer. Windows 8, 7 and Vista (as does XP) installs with Windows Firewall installed and enabled. 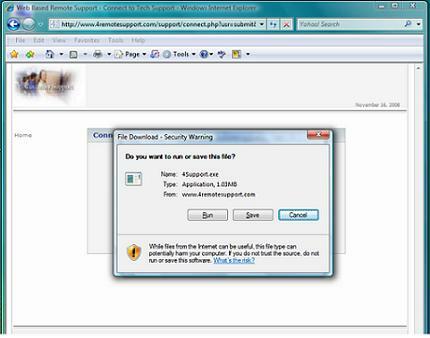 The remote user will receive a windows firewall warning message. You'll already be connected at this point even with this message and firewall running. You will see the message too and be able to click Unblock for the user if they have not done so already. Click Unblock (You'll already be connected at this point). Before it connects it will be white and blue (or white/grey). When connected it will be black and green. 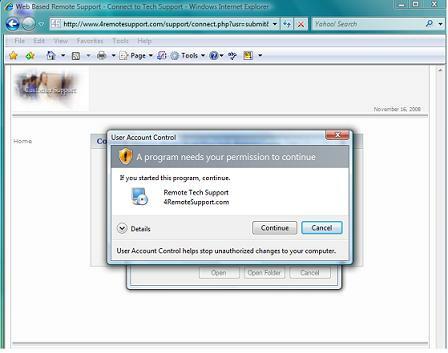 Your remote support account permits remote pc access for remote desktop control of an unlimited number of remote computers on the web to provide live remote tech support assistance online to users located anywhere on the Internet. You can even connect to and support remotely multiple computers at the same time.